Please, this is no time for violence. Is a moment of silence so much to ask for? 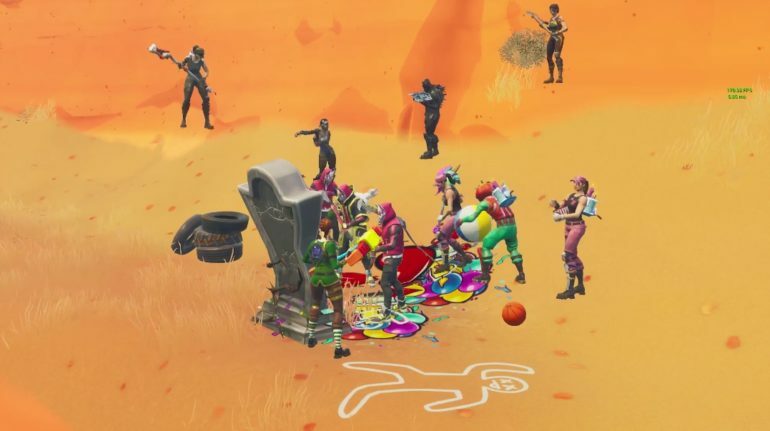 Earlier this week, Fortnite‘s 5.1 update erected a gravestone honoring Chappadoodle: A player who found themselves stranded on a cliff side only to be ultimately killed by their own rescue party. Players on the Fortnite subreddit thought it would only be appropriate if they held a funeral procession. Then the fighting started. A meeting was arranged to meet by the monument, orchestrated over the sleepier Oceanic servers as not to experience many party crashers. Not that it mattered in the end. After gliding down to the monument, the sobering affair lasted mere seconds before one user, thederpytroller, lived up to their name. Dressed like a pirate, thederpytroller wanted to see if the gravestone was destructible. With little respect to the dead, thederpytroller took a few thwacks to the tombstone and discovered it could indeed be annihilated. As seen in a video titled “Killer at Chappadoodle’s Funeral gets Instant Karma,” the funeral procession then struck back. Thederpytroller joining Chappadoodle in the great beyond. Back on Reddit, thederpytroller said it was an accident, and that they really didn’t think the gravestone could be obliterated. Commenters said they’ve never seen someone killed so quickly. The original Chappadoodle clip was a viral sensation. Streamer Mr Muselk come across the stranded player and attempted to orchestrate a rescue, carefully sliding a golf cart down the rockface so that Chappadoodle could bounce back up. The cart instead slid out of control and knocked Chappadoodle into the ocean. A set of tires have been put in place to ensure such a tragedy never strikes again.